You don’t have to be a diver to join our program; a part of our program is your diving certification. Are you already a diver? Then you will receive your next level of certification as part of your package. Your level of experience doesn’t matter – we’ll make sure you’ll enjoy diving around the Gili islands! 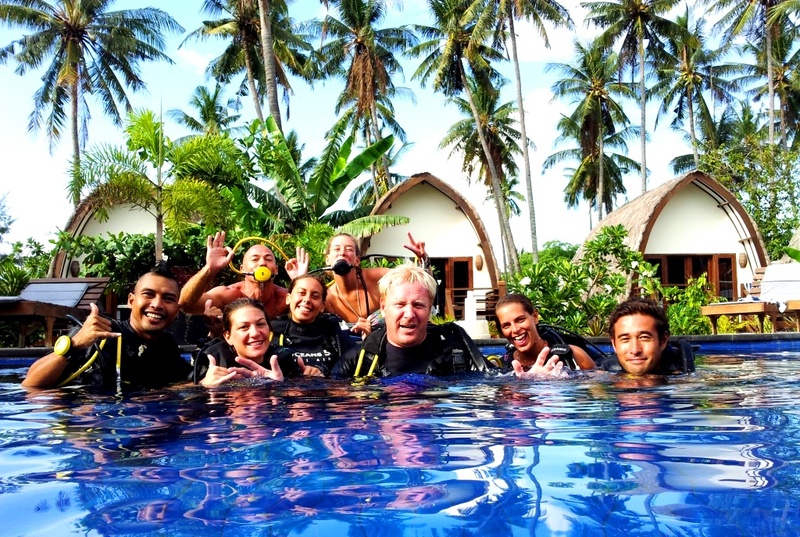 We collaborate closely with the PADI 5 star IDC Dive Resort Oceans 5. No matter what course you would like to do, the instructors of Oceans5 will make sure it will be a fun and unforgettable memory. Together we offer you a full range of PADI dive courses, from your Open Water course to your Divemaster certification. During your first week on Gili Air, you will complete your diving course, the PADI AWARE Shark Conservation Distinctive Specialty Course and the PADI Scientific Diver Distinctive Specialty Course. Furthermore we train you in the several research methods that we use for our projects. After your introduction week you have all the skills and knowledge that you need to start with marine wildlife conservation around the Gili Islands in Indonesia! To become a PADI Open Water diver you need sufficient swimming skills and want to be in suitable physical health. It’s not necessary to have previous knowledge or experience. The course takes around 3.5 days and focuses on Knowledge Development, so you understand the basic principles of scuba diving, Confined Water Dives to learn basic scuba skills and 4 Open Water Dives to use your skills and explore the magical underwater world diving Gili Islands! Once you completed your PADI Open Water course you are certified to dive anywhere in the world to a maximum depth of 18 meter. Happy Bubbles! Are you an Open Water Diver and want to improve your skills and expand your knowledge? Sign up for you PADI Advanced Open Water Course. During this 2-3 day course you will do five different adventure dives of your choice. On each dive, you focus on a different subject, for example: night diving, wreck diving, deep diving, how to navigate underwater, how to make great pictures underwater, how to improve your buoyancy or learn more about fish and corals. There is no exam involved in this course, it’s all about diving and gaining experience! The PADI Rescue Diver Course is the most challenging and rewarding course you can do. You will not only learn how to improve your dive skills, but also how to look after other divers. During this course you get trained to solve several problems that can appear underwater and on land. What to do when your buddy starts panicking underwater? How can you avoid dehydration or a heat stroke? What are the steps to follow when you find out your buddy went missing? The PADI Rescue Diver Course prepares you to deal with dive emergencies using a variety of techniques. Through knowledge development and rescue exercises, you learn what to watch out for and how to respond in case of an emergency. But be careful: for most people the PADI Rescue Diver Course is the first step in their professional diving career. Besides your PADI Open Water Course or your next level of certification, you will receive 2 scientific diving courses as part of your program. 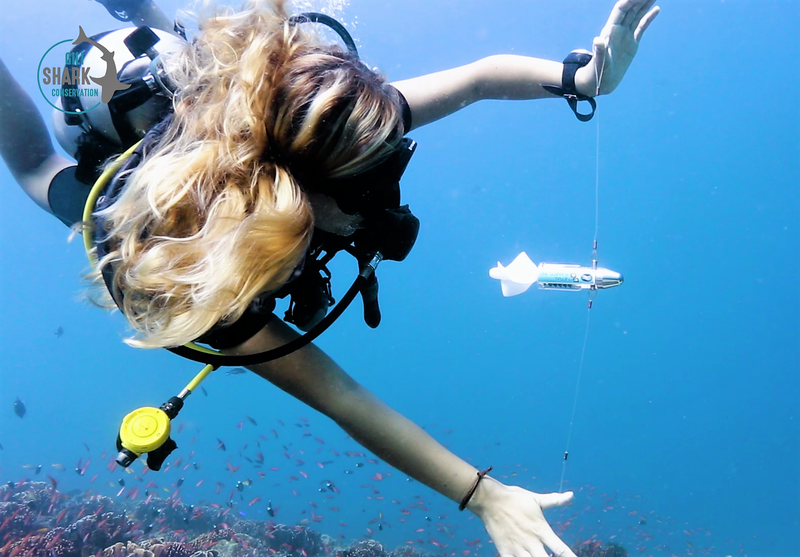 Are you interested in making your dives count by getting involved in conservation efforts? Would you like to know how your dives can help to protect the underwater world? Then the PADI Scientific Distinctive Specialty is the course for you. The PADI Scientific Diver Distinctive Specialty Course is designed to train and inspire divers of all levels to help reduce damage to the environment while collecting data to support scientific research. This PADI Scientific Diver Distinctive Specialty contains knowledge development; presentations, workshops, and 4 open water training dives. It helps you to build your confidence in diving, expand your diving skills and gives you an introduction into scientific diving. We will teach you proper buoyancy control techniques combined with training in fish identification and roving survey diving; a basic research diving data collection methodology. We know that shark populations are facing tough challenges these days. But do you know why their numbers are decreasing and, more importantly, what you can do to help? Did you know that divers can help secure a brighter future for sharks? 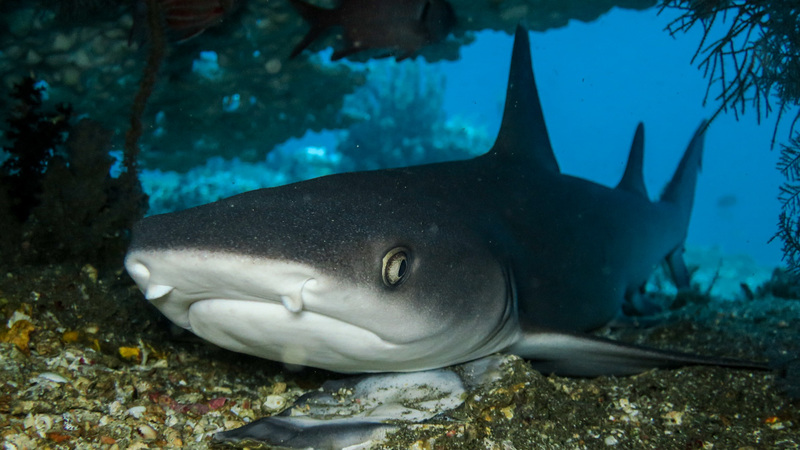 During this course we focus on the value of sharks to our marine ecosystems and economies, we educate you about the causes of declining shark populations and we will help you to understand what is missing in the current shark fisheries management. This 2-day Project AWARE diver specialty course, includes a workshop discussing current topics in global shark conservation and a dive at Shark Point and Manta Point.